You've just said your vows and now you're ready to party! Did you know that wedding guests remember the wedding cake almost as much as they do the wedding itself? So why not give them the best… a Frederick's wedding cake. 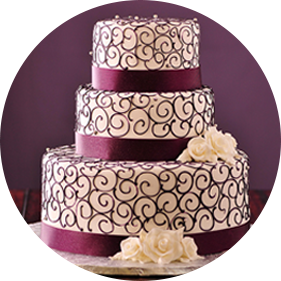 Frederick's Pastries has been specializing in wedding cakes since 1980 and has designed thousands of awe-inspiring and delectable cakes for thousands of happy couples. Not only beautiful, they are delicious… baked fresh with only the finest ingredients just for you! Schedule your complimentary tasting today and taste for yourself why Frederick's has been named Best of New Hampshire, by the people of NH, time and time again and voted into The Knots Hall of Fame!